Shirts, Spoons and Flats Packages. Flats Package $20.00 each – perfect for a day’s session! 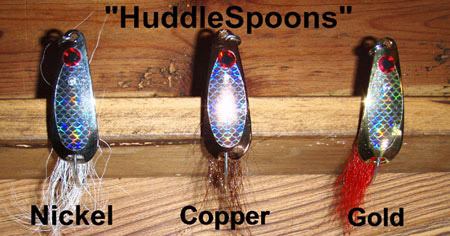 *Package includes: 5 Turtlegrass Slamrs, 5 Motor Oil Slamrs, a HuddleSpoon with SPro swivel, 2- 1/8 ounce Hula Gamakatsu Jig Heads and a Custom Pumpkin Jig Bucktail. There is also an picture illustration on tying a double uni-knot for line to leader. All items available for sale at our office.